The State Street Global Investor Confidence Index (ICI) decreased to 70.2, down 9.4 points from December’s revised reading of 79.6. Confidence deteriorated in all the regions covered separately by their own Investor Confidence Index; North America (by 7.7 points decrease to 66.8), Europe (by 2.6 points to 90.3) and Asia (by 10.3 points to 100.2). The index, developed by Kenneth Froot and Paul O’Connell at State Street Associates, measures investor confidence or risk appetite by analyzing the buying and selling patterns of institutional investors. The index assigns a precise meaning to changes in investor risk appetite: the greater the percentage allocation to equities, the higher risk appetite or confidence. A reading of 100 is neutral; it is the level at which investors are neither increasing nor decreasing their long-term allocations to risky assets. The index differs from survey-based measures in that it is based on the actual trades, as opposed to opinions, of institutional investors. A comparison between the Global ICI and gold prices suggests the two are inversely correlated and that the index leads gold (see Chart). 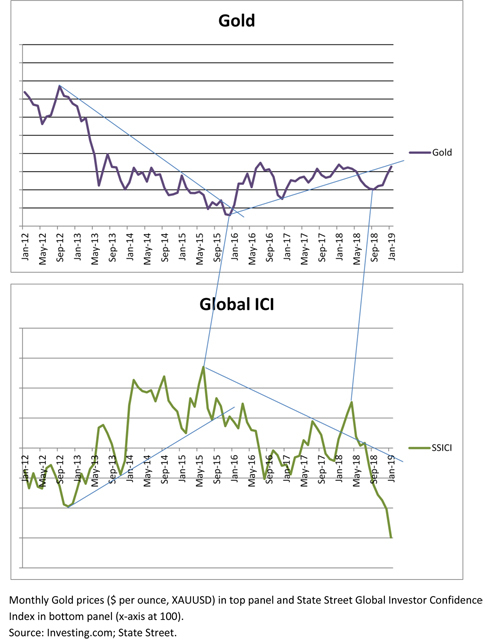 Given the sharp deterioration in the Global ICI, this provides fresh evidence for continuation of the current bullish trend in gold. More information on the State Street Investor Confidence Index is available at http://www.statestreet.com/ideas/investor-confidence-index.html.